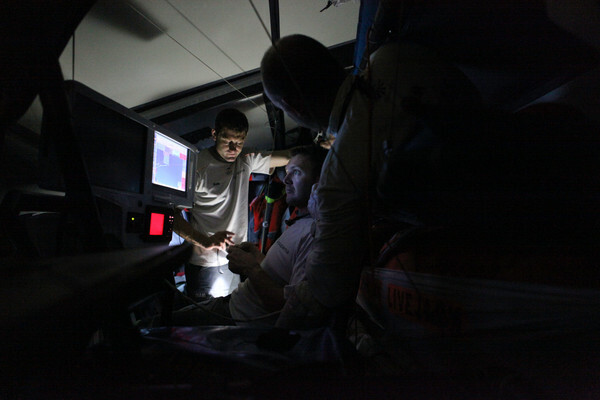 "However, the weather is very complicated up ahead: it's hard to know which option we're going to take, as there are a lot pitfalls in front... We already know that the others are going to catch up with us over the coming hours, but fortunately everyone's following the same course at the moment. We're likely to go through every point of sail on our way to Lisbon, and even some upwind sailing in the middle of the Atlantic. It promises to be extremely varied and we're likely to go through the entire sail wardrobe... We shouldn't get too close to the ice zone offshore of Newfoundland." 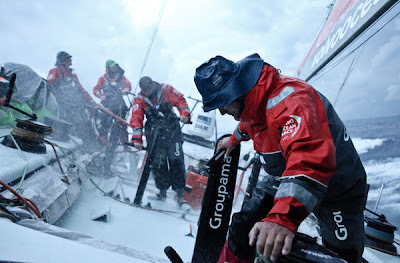 By diving onto a direct course earlier than their rivals, Franck Cammas and his men managed to avoid the worst of the tropical storm Alberto: the other five crews were surprised by the centre shifting over and some of them have even had to sail upwind in over 45 knots of breeze! 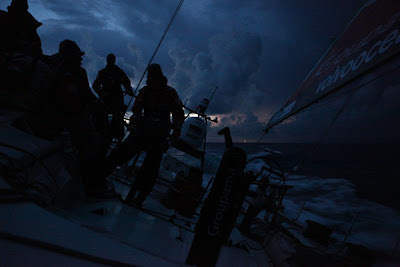 With storms, squalls and lightning, it was an `end of the world' scenario, on seas which were raging due to the violent wind rotations on top of the oceanic current of the Gulf Stream. 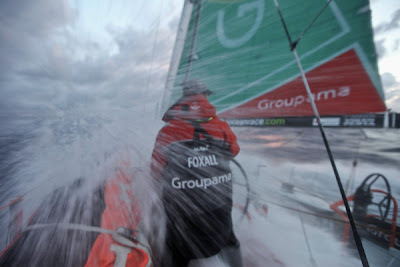 As such Groupama 4 was able to extract herself from all that without damage, as well as opening up a lead which was bordering on 50 miles midway through the afternoon (local time) on Monday. However, between the tropical phenomenon and a depression threading its way towards Newfoundland, a zone of lighter wind then slowed the progress of the French boat. "After the Brazil-Florida leg, we'd promised ourselves that we'd be in on the action straightaway: we haven't spared any effort! 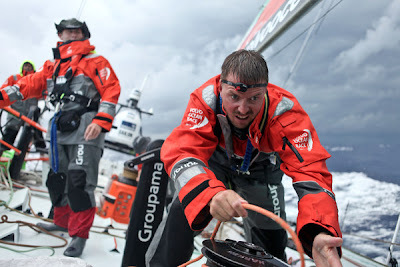 We got a good start to the leg, because we were correctly positioned from the coastal course. And since then, we've managed to weave our way along nicely in the tropical storm. As we were the first to gybe, we avoided the zones of instability at the centre of the disturbed system, which enabled us to extend our lead over the course of Monday. "Since the end of the night, we've fallen upon light airs and I'm hoping we won't be totally becalmed! The fleet behind is not escaping the influence of the depression and its again benefiting from steadier wind: there will certainly be some regrouping before our rivals hit the same wind as us... 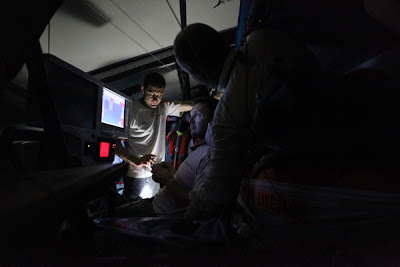 In any case, we were happy to have put in the gybe within the tropical storm Alberto before everyone else, but even we flirted with the centre for a while, as the systems are very hard to spot on the grib files and they're moving very quickly." On exiting tropical storm Alberto, Groupama 4 sought to hook onto a front, which is rolling in from Newfoundland to the Caribbean, where the southerly wind is set to build from sunset (local time). This front will push the Azores High along for the next few days, but as it disintegrates the further East it gets, a depressionary minimum will form across the fleet's trajectory. "The back and ankle problems I had in Miami have been resolved: we've had two very active days on deck, especially yesterday, with a lot of spray and waves. It was nice to familiarise ourselves with what high speeds were like again. 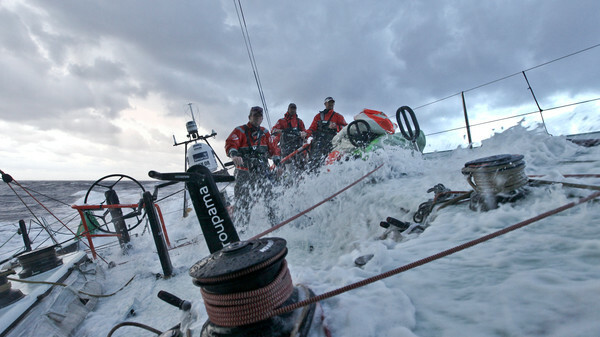 Fortunately things weren't too violent and it was even rather nice to rediscover boisterous conditions. "My health and that of the rest of the crew is tip-top aboard Groupama 4. Furthermore, the temperature is perfect for getting in some good rest today. The atmosphere aboard is good, because the whole crew is focused on speed and our position as leader is positive. Added to that, this leg should be nice and short. For now, we're sailing our own race, without focusing on a particular adversary. Puma's certainly at ease and has been quick over the last three legs so the Americans are on an upward spiral... However, there are still some pieces of the jigsaw to put together before Lisbon"